Trade show season is wrapping up and winding down, but that doesn’t mean that there won’t be more throughout the year to attend. Generally, trade show season is known to be February through April but technically it’s always tradeshow season. There is bound to be some convention to go to where you can advertise your brand, so you must be prepared! Here at SpeedPro, we can help you out with any trade show display printing that best fits your needs. If you’re on a budget the retractable banner stand is a great way to go. This allows your printed graphics to be rolled up into a hardware base and comes with a collapsing pole and case. The retractable banner is super portable so you can travel with it anywhere and don’t have to worry about it getting ruined. Table throws are also another option. They’re vibrant and eye-catching and anyone walking by can’t miss your company name when it’s right there. You can also try a mini tabletop banner stand. They’re small but straight to the point and give your display that last final touch of flare. If you really want to make your display stand out and if space permits you could try using floor graphics. They don’t have to just go on hardwood floor either, you can use them on carpet too! Whether it’s directional graphics or you have your logo, any creative graphics on the floor are bound to create buzz because they’re so uncommon. These are just a few ideas of ways to create a basic tradeshow setup. However, at SpeedPro East Bay we can get way more fancy than this. If you’re looking to really wow trade show attendees, we can create some extravagant 3-dimensional displays and you can see some awesome examples here. 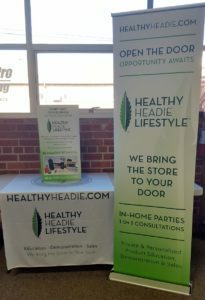 Trade show season doesn’t have to be over and when you’re attending your next event we want to be your go-to people!